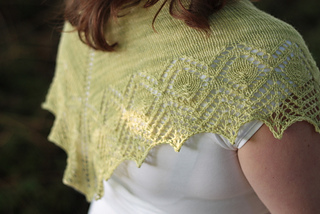 This small shawl is designed to use one 100g skein of 4 ply sock yarn. It is ideal for covering your shoulders or wrapping cosily around your neck on cooler days. It is also perfect for knitters who are new to triangular shawls, as well as for more advanced knitters who are looking for a TV or travel knitting project. The lace section of this pattern is charted, the main section is written out. 21.5sts x 36 rows over 10cm by 10cm square in stocking stitch. Please note that gauge is not crucial for this project. Wingspan 109cm (43 inches); Drop 48.5cm (19 inches).